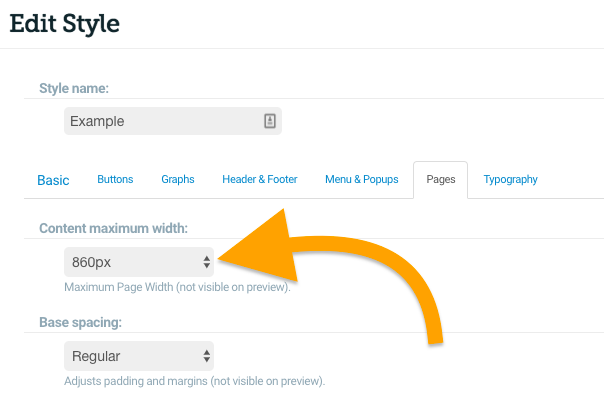 Page Name - This will add a text area which will automatically be populated with your Page name when viewed in Preview. Project Name - This will add a text area which will automatically be populated with your Project Name when viewed in Preview. Introductory Text Box - This will add an editable text area with a large font size. Text Box - This will add an editable text area with a standard font size. Client logo - This will add an image field which will automatically be populated with your logo, you can choose your logo by adding it in the Styles panel. Image - This will add an editable image area which can be edited in Author view using the Image icon. Image that covers area - This will add an editable image area which will expand to fit the contained you have chosen. Audio player - This adds an Audio player which can be edited in Author view using the Audio icon. Video player - This adds a Video player which can be edited in Author view using the Video icon. Branching video - This adds a Video player which can be edited in Author view using the Video icon, this part asks the learner a question at the end of the video and will then send the learner to a different page depending in their response. Please see here for more information. Menu/link pages - With menus when your learner clicks on a button you are taken to a new page within your course. These are a useful tool for non-linear learning. Hotspot - Hotspots page types contain buttons which launch pop up windows. These are especially useful for information heavy pages. Splitting your information down into smaller chunks greatly helps your Learner to take in information, they work especially well on mobile phones, where screen size is limited. Buildup - With this page type, you press on the first item, which then reveals the 2nd, then pressing on the 2nd reveals the 3rd, and so on. A nice way of explaining consequences of actions to Learners for instance. Flipcards - A great tool for memorisation - pressing on the Flashcard turns it over to reveal the other side. Accordion - The accordion page type has buttons which, when clicked, expands to reveal a panel below that can have text and images in. Great for breaking up large chunks of text based content. Tabs - The tab page type, similarly to the accordion has buttons which, when clicked, reveal a panel that can have text and images in. Great for breaking up large chunks of text based content. Carousels - A carousel is an interactive sequence of quite visual slides. They are often used as Image Galleries on the web. Within our induction course, we use them with pictures and quotes from staff members. Timeline - With this page type your learner can click hotspots on the Timeline to get more information about your subject. This allows you to add a Knowledge check to your page, click here to view all of the different Knowledge checks that are available in Elucidat. Learner Text Input (single line input/multiple line input). Free text - This creates a part that allows your learner to add free text to your Project, this text can then report to your LMS as a question (if your LMS accepts these statements and if you have created the part in version 5 upwards of the standard Elucidat themes). You can lock the page until the user has responded to the free text by selecting the ‘Page setting’ of ‘User opening ALL PARTS of the page’ and choosing ‘Prevent progress until complete. Free text answers can also be seen in your Analytics. Image Card with Link - This part will direct your learner to a page or external link when clicked, you can choose where this part links to using the ‘Link’ control when in ‘Author’ view. Text Card with Link - This part will direct your learner to a page or external link when clicked, you can choose where this part links to using the ‘Link’ control when in ‘Author’ view. Animated icons Alert/Error/Success - This part will add an animated icon to your page, the icon will animate when displayed on the screen. Drag anything - This adds a container in which you can drag and resize items using the ‘Size’ and ‘Move’ icons, please note that content created in this way will not work responsively unless you make changes using the ‘View mode slider’ in Author view.